Santa's reindeer are 2 metres 31 cm tall to the tips of their antlers. Sam has built a huge square based pyramid of cans of reindeer food exactly the same height as the reindeer and decorated it with fairy lights. Each layer of the stack is made up of a square array of cans. How many cans has he used (cans are 11 cm high)? Santa arrives, the reindeer are very hungry and Sam takes his display down, feeds the reindeer and uses all the remaining cans to rebuild the display into a triangular based pyramid of exactly the same height as the square based pyramid he had before. How many cans of food did he feed to the reindeer? 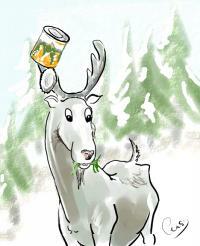 Are there enough cans left to feed the reindeer another meal of the same amount another day? Here is a collection of puzzles about Sam's shop sent in by club members to keep you busy over the Christmas and New Year holiday. Perhaps you can make up more puzzles, find formulas or find general methods. make two stacks: one which has 5 cans on the bottom layer and so on, which would be 5 layers high ($T_5$) and the other would have 6 on the bottom layer and so be 6 layers high ($T_6$). But she has recently had a delivery of 100 cans, so she now has 136 cans. She can now arrange her cans into 4 $T$-stacks in two different ways. Selecting and using information. Triangle numbers. Mathematical reasoning & proof. Counting. Visualising. Permutations. Creating and manipulating expressions and formulae. Combinations. Combinatorics. Working systematically.